WHERE AM I? is a new documentary about the skills we use to find our way around. Whether you are an Inuit hunter, a foraging insect, or just someone out for a stroll, your brain is performing one of its most fundamental services -- it's navigating. 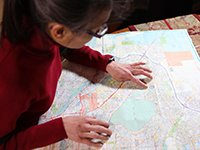 Why are some of us good at finding our way, while others are not? WHERE AM I? explores the strategies we use to figure out where we are - and where we are going. Are some strategies simply better than others? It also looks at the navigation skills we share with animals, and some animal skills we wish we had. Are you simply born a terrible navigator? If you aren't good at finding your way, what are the solutions? The program examines how GPS has affected wayfinding, and why some researchers think it's so bad for our brains that it may even lead to early senility. Several experts weigh in on the topic including neuroscientists Giuseppe Iaria, Sue Becker, Hugo Spiers, and Véronique Bohbot; insect biologist, Tom Collett; psychologist Nora Newcombe, head of the Spatial Learning and Intelligence Centre at Temple University; geographer and behaviorist Dan Montello; Ken Jennings, 'Jeopardy' champion and author of "Maphead"; roboticist and biologist Michael Mangan; and psychologist Colin Ellard. "Where Am I? is a wonderful example of how spatial cognition research can be presented to a wide audience without sacrificing detail. It is fantastic to see so many excellent colleagues performing their best to promote spatial cognition research. A perfect combination of overview and depth--the film is a little masterpiece that will become an integral part of my lectures." "This documentary would have multiple applications in biological sciences, psychology, sociology, and geography curricula." "We have all taken a longer route than was necessary, received terrible directions, or become hopelessly lost. Where Am I? provides interdisciplinary explanations for why these things happen through interviews with leading experts in psychology, spatial cognition, neuroscience, and biology. It does an excellent job of blending current scientific research and spatial theory with real-world applications to describe spatial behaviors, what brain structures underlie navigation, and why this knowledge is important for technology development. I have worked in the field of human spatial cognition for 15 years and think this is the most rigorous, informative, and entertaining film on the topic. Where Am I? is an excellent resource for anybody interested in navigation, whether they be students, researchers, hikers, orienteers, or anyone wanting to better understand one of the most important and unappreciated behaviors of daily life." "A thoughtful analysis of how navigators from honey bees to London cabbies are able to move through natural and built environments. The film features engaging interviews with a host of researchers. The narration is supported by remarkable locational footage, including a wonderful interview with Inuit hunters describing how they navigate across barren arctic landscapes." "This engaging program provides insights into the science behind the everyday activities of mental mapping and wayfinding. It encompasses a broad spectrum of research approaches along with case studies that range from the lowly ant to humans with unusual spatial abilities (both good and bad). Amidst the brain images, virtual-reality environments, lab studies and experts' observations, Where Am I? illustrates how evolution has made the human brain into a multi-purpose device with some sacrifice: Capabilities that are built directly into the neural structures of lower organisms require effortful feats of cognition by people, and not all succeed." "Urban planners, public health specialists, advocates, and any person interested in making cities into more livable, healthy places can use Where Am I both to make a case for exploration and independent mobility and as a cautionary account of how navigation technologies may be undercutting the health benefits of wayfinding. The documentary is especially engaging in the way it makes a novel but essential case for 'active' travel - in this case travel that exercises the brain and develops the cognitive map...An entertaining and compelling collection of research and vignettes." "Where Am I is a fascinating look at how humans navigate unfamiliar places and form 'cognitive maps.' Because navigation and cognitive mapping are abilities that humans share with other species, the documentary draws on both human and non-human studies of spatial cognition...Interviews with biologists, psychologists, neuroscientists, and even a roboticist, along with engaging portrayals of the wide variety of ways of investigating spatial cognition, provide a valuable and entertaining overview of this emerging area of science." "Interesting and accessible...informative video, smoothly integrating cultural and neurological perspectives...Students, the general public, and anthropologists working on the biological basis of complex behavioral abilities should find it interesting and thought-provoking. Suitable for high school classes and college courses in cultural anthropology, cognitive anthropology, and anthropology of embodiment/spatialization, as well as for general audiences." "A fascinating examination...An interesting study of how the brain is used for navigating, using both memory and imagination." "Highly Recommended...Provide[s] insights into the science associated with everyday activities of mental mapping and navigation...Where Am I is a good resource for students, researchers, hikers, orienteers, as well as those interested in navigation." "A fine introduction to understanding brain functions within distinctive environmental situations...intriguing and entertaining." "Where Am I? reveals what the latest scientific findings have to say about this intriguing topic...Is as fascinating as it is educational." "Provides an engaging introduction to the subject."